For the September 2015 segment of Righting Crime Fiction, I’ll be responding to a question asked by Writer Nina Mansfield over on Short Mystery Fiction Society’s Yahoo Group. She asked if it was possible for a handgun fired from ten to fifteen feet away to knock over a “flimsy” plastic chair. My immediate response was going to be to explain how plastic offers little resistance and bullets travel at a very high rate of speed, so the bullets (any bullet) would zip right on through without even budging the chair. I was going to support my opinion with examples of things I’ve experienced and prior tests I’ve done over the years, but then I suddenly remembered I wanted to be a writer when I grew up, and writers are supposed to *show* and not *tell*. Thus, I decided I would show her—and everyone else who might benefit from the information—what happens when one shoots a flimsy plastic chair with various firearms. First thing this morning, I drove out to the local Dollar General store and bought a flimsy plastic chair for $8.00. I then headed to the shooting range with five handguns, a rifle, a shotgun, and a camcorder to put her question and my opinion to the test. I set the chair out to about fifteen feet and fired one shot from each of the firearms I’d brought, with the exception of my .308 Accuracy International sniper rifle. I met a guy named Charlie who was shooting a .308 Savage precision rifle, and I let him shoot the chair twice with his rifle. I set the camcorder up on a tripod and it remained trained on the chair during the test shots, so as to record any possible movement of the chair when the bullets struck it. My course of action was as follows: I loaded and fired a shot from the .22 revolver, activated the zoom on the camcorder to get a close-up view of the bullet hole, zoomed out, and then followed the same procedure with all of the other weapons, with the exception of the .308 rifle (as described earlier). In order to increase the odds of knocking the chair over, I aimed at the top of the backrest. As you can see, the bullets zipped right on through the plastic without even causing the chair to flinch. The bullet causing the most damage was the 12-gauge 1oz slug, which is a fearsome round. The football, which has more volume and travels much slower than a bullet, “pushed” the chair over onto its back, as would be expected. Note about the football: I’d love to be able to say I called Drew Brees over to throw the football at the chair for this experiment, but he was in Arizona trying to win a football game. I’d like to thank Nina for asking the question, as it gave me a great excuse to head out to the firing range (like I really need one:-) and it was great fun. Check out her bio below and visit her website to find out what she’s been up to. Nina Mansfield is a Connecticut based writer. Her debut novel, Swimming Alone, a young adult mystery, was published by Fire & Ice YA in August 2015. Nina began her writing career as a playwright; she has written numerous plays, which have been published and produced throughout United States and internationally. Nina is a member of, Mystery Writers of America, International Thriller Writers, Sisters in Crime, the Society of Children’s Book Writers and Illustrators and the Dramatists Guild. Please visit her at www.ninamansfield.com. BJ Bourg is the author of JAMES 516 (Amber Quill Press, 2014), THE SEVENTH TAKING (Amber Quill Press, 2015), HOLLOW CRIB (Five Star-Gale-Cengage, 2016), and BUT NOT FORGOTTEN (Amber Quill Press, 2016). Copyright © 2015 by BJ Bourg. All rights reserved. Welcome to the August 2015 edition of Righting Crime Fiction. 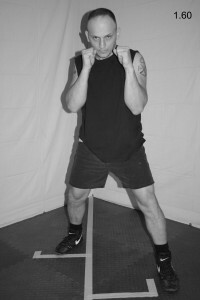 This month, I’m continuing with the footwork techniques segment of my “Writer’s Guide to Fighting” series. After wrapping up the techniques, I’ll detail some exercises to help improve a fighter’s footwork. 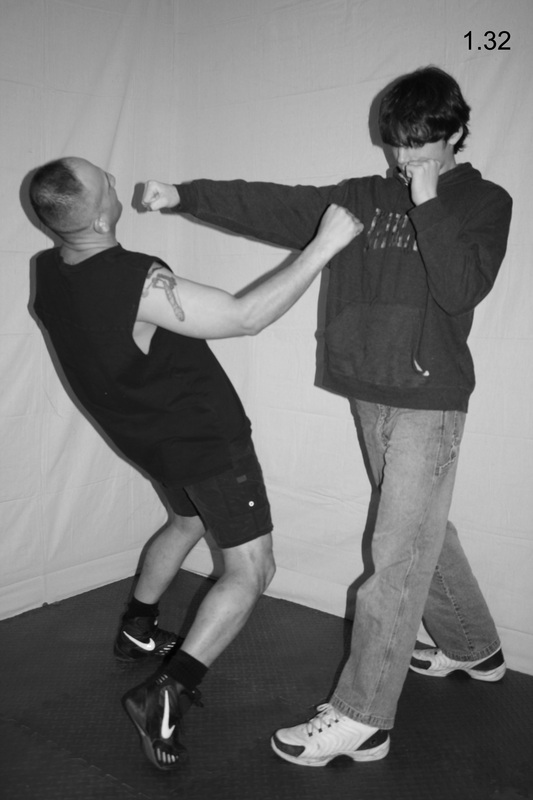 Moving directly forward against a retreating suspect can sometimes be risky, because your head and body remain along the same line of attack. Utilizing the diagonal front step can move you forward while taking your body out of the line of attack and creating an angle from which to deliver strikes of your own. 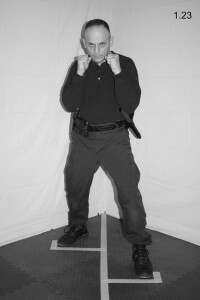 Additionally, the diagonal front step can be effective against a suspect who is advancing toward you. By utilizing the diagonal front step, you will be able to close the gap quicker than your suspect expected while moving your body out of the line of fire. You can simultaneously execute various types of strikes, such as a right straight knee, to help end the physical confrontation. Step One: From your fighting stance (see Fig. 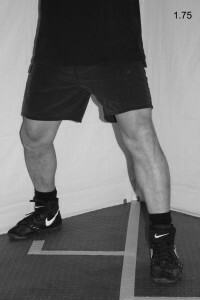 1.64), push off with the ball of your right foot and slide your left foot about one half step forward and diagonally to the left, at about a forty-five degree angle (see Fig. 1.65). Step Two: Quickly drag your right foot forward and diagonally the same distance the left foot traveled, which will bring you back to your fighting stance (see Fig. 1.66). For a close-up of the diagonal front step leg action, see Fig. 1.67 – 1.69. Moving directly rearward against an advancing suspect can sometimes be risky, because your head and body remain along the same line of attack and your suspect can move forward quicker than you can move backward. If your suspect were to reach you, he would have momentum on his side and could tackle you to the ground. 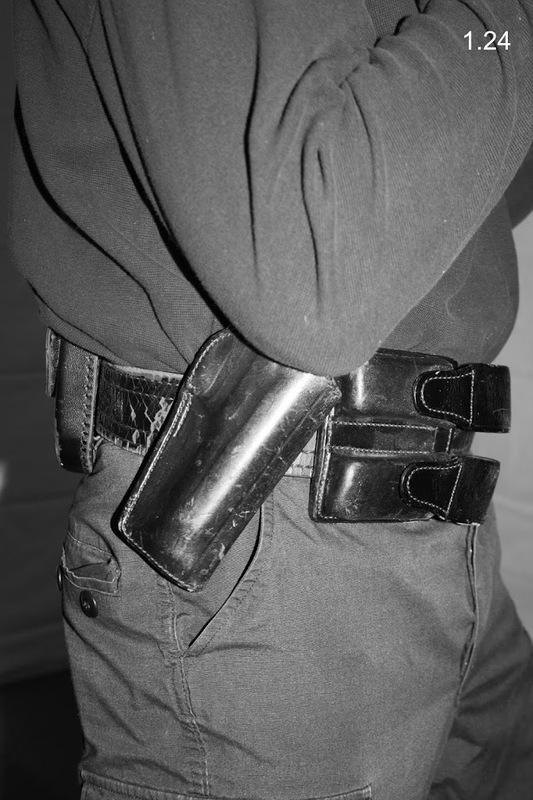 Thus, it is imperative you get out of the suspect’s line of attack while positioning yourself to deliver strikes of your own that can help end the physical confrontation. The diagonal back step can help you accomplish these goals. 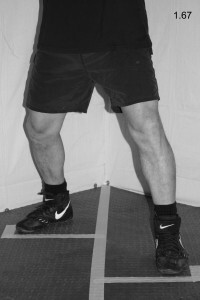 The diagonal back step can be even more effective when used in combination with other footwork techniques, such as pivots and side steps. 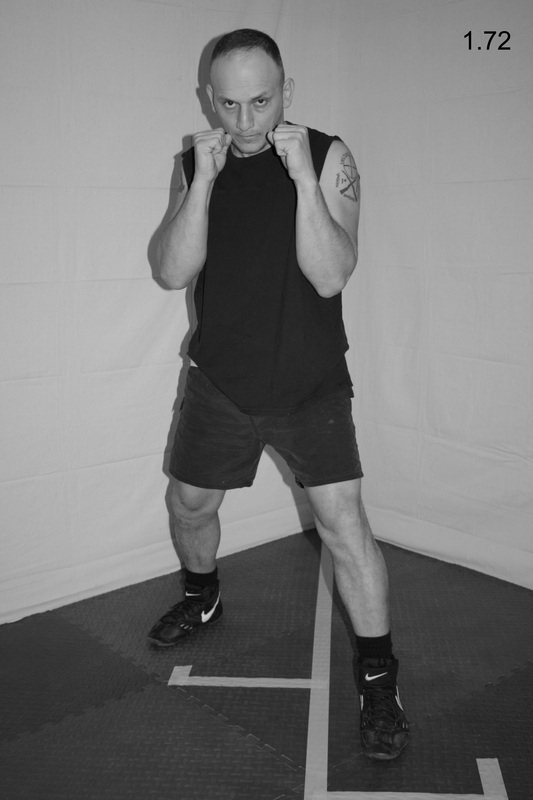 Step One: From your fighting stance (see Fig. 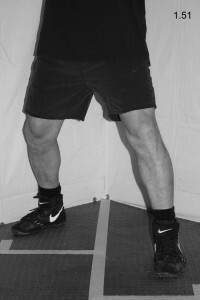 1.70), push off with the ball of your left foot and slide your right foot about one half step rearward and diagonally to the right, at about a forty-five degree angle (see Fig. 1.71). 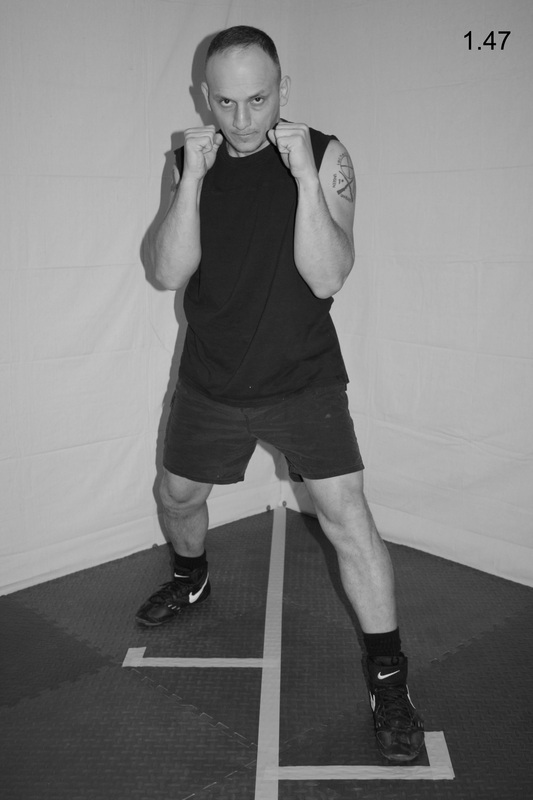 Step Two: Quickly drag your left foot rearward and diagonally the same distance the right foot traveled, which will bring you back to your fighting stance (see Fig. 1.72). For a close-up of the diagonal back step leg action, see Fig. 1.73 – 1.75. The counterclockwise pivot is a technique that spins your body forward and is great for matching your suspect’s movements, evading strikes, or creating angles from which to launch your own strikes. It is also a great technique to use to keep up with a suspect who is trying to circle you to the left in an attempt to get behind you. Your suspect’s movement will determine how far you pivot. 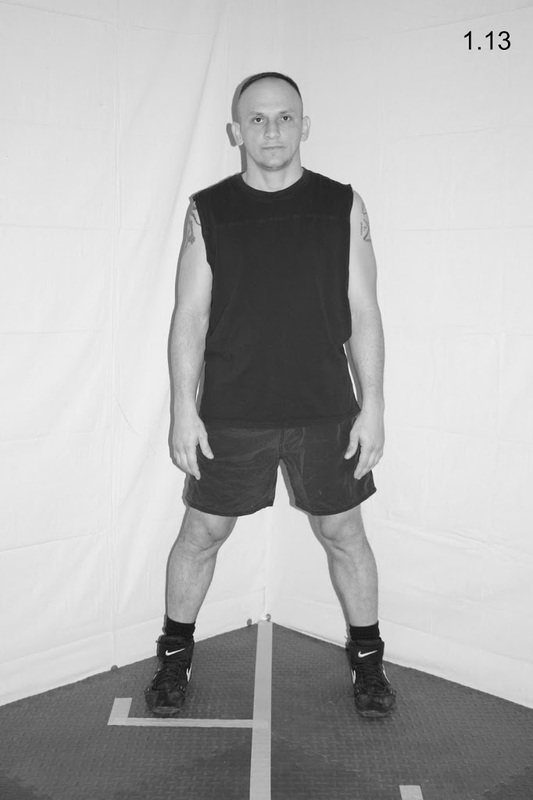 If your suspect moved around to your immediate left, you would pivot ninety-degrees to keep him in front of you. If your suspect moved slightly to your left, you would pivot at about a forty-five degree angle to keep him in front of you, and etc. 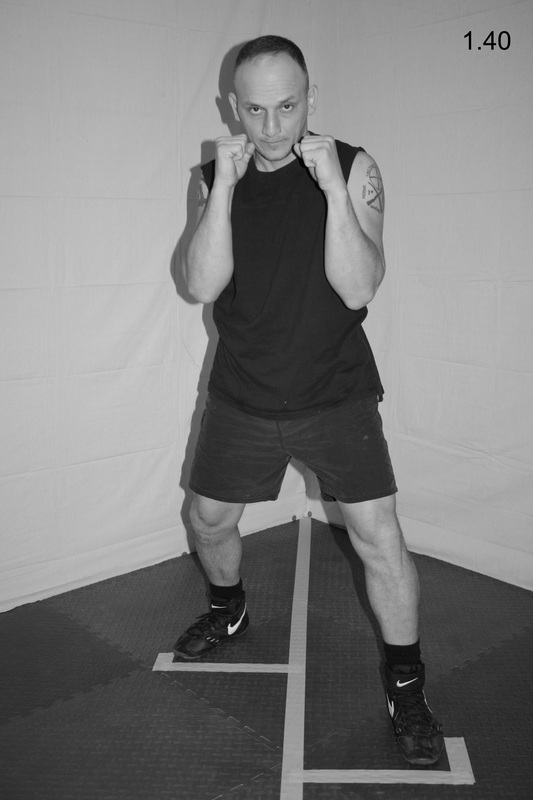 Step One: From your fighting stance (see Fig. 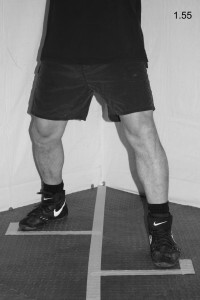 1.76), imagine the ball of your left foot is nailed to the floor. Push off with the ball of your right foot and pivot counterclockwise on the ball of your left foot, sliding your right foot along the ground in a forward arc (see Fig. 1.77). Step Two: As you pivot, your entire body should move in concert with your right foot and you should maintain your fighting stance throughout the pivot. When you end the pivot, you should be back in your fighting stance at an angle to your suspect (see Fig. 1.78). For a close-up of the counterclockwise pivot leg action, see Fig. 1.79 – 1.81. 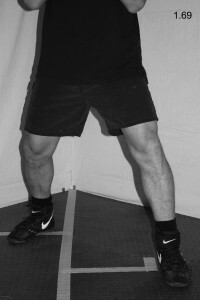 The clockwise pivot is a technique that spins your body rearward and, like the counterclockwise pivot, it is great for matching your suspect’s movements, evading strikes, or creating angles from which to launch your own strikes. It is also a great technique to use to keep up with a suspect who is trying to circle you to the right in an attempt to get behind you. 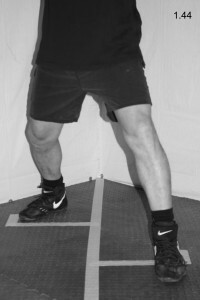 Pivoting works great in combination with other footwork techniques. If you are constantly changing direction and distance, while pivoting to create angles, your suspect will have a hard time finding you in a fight. 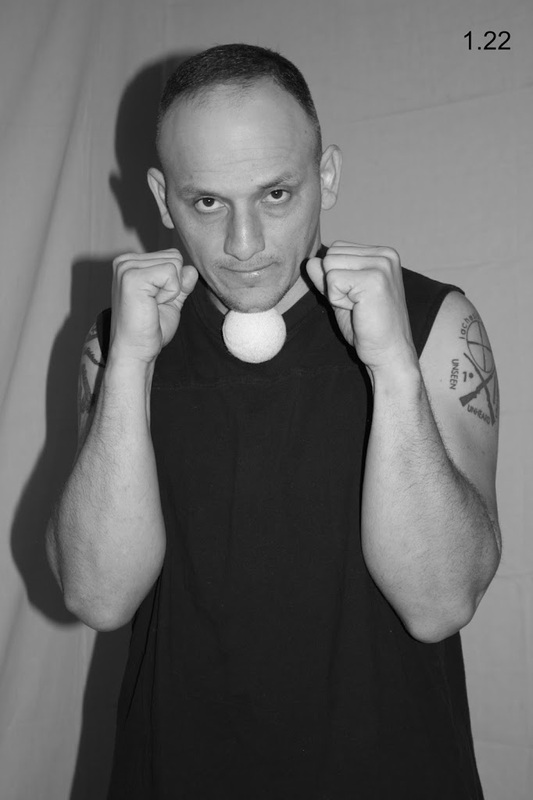 It will also help create openings for your strikes to land, which will greatly increase your chances of delivering fight-stopping strikes. 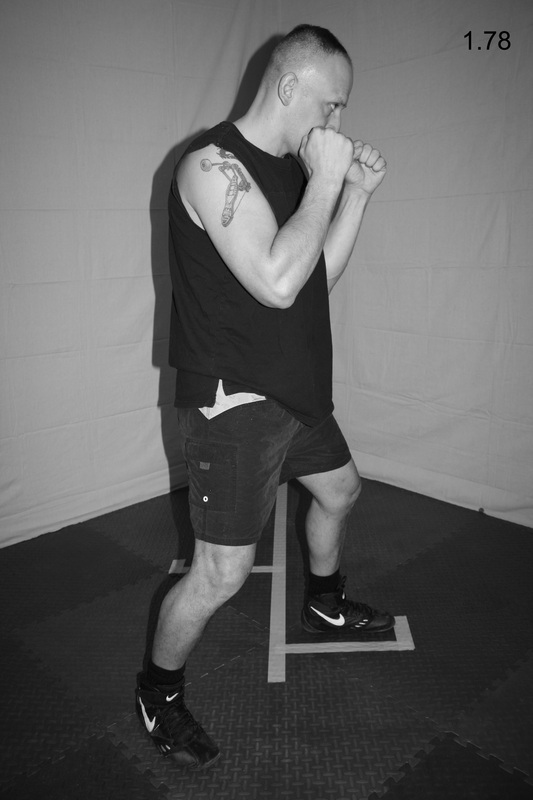 Step One: From your fighting stance (see Fig. 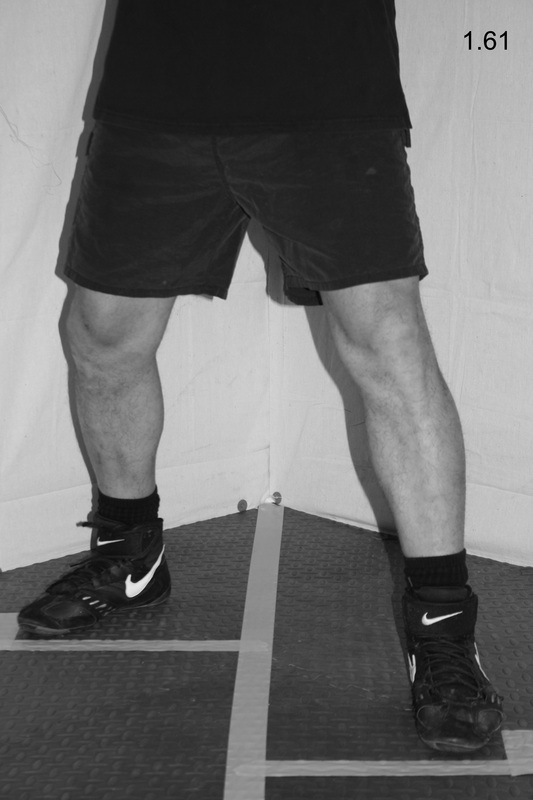 1.82), imagine the ball of your left foot is nailed to the floor. Push off with the ball of your right foot and pivot clockwise on the ball of your left foot, sliding your left foot along the ground in a backward arc (see Fig. 1.83). 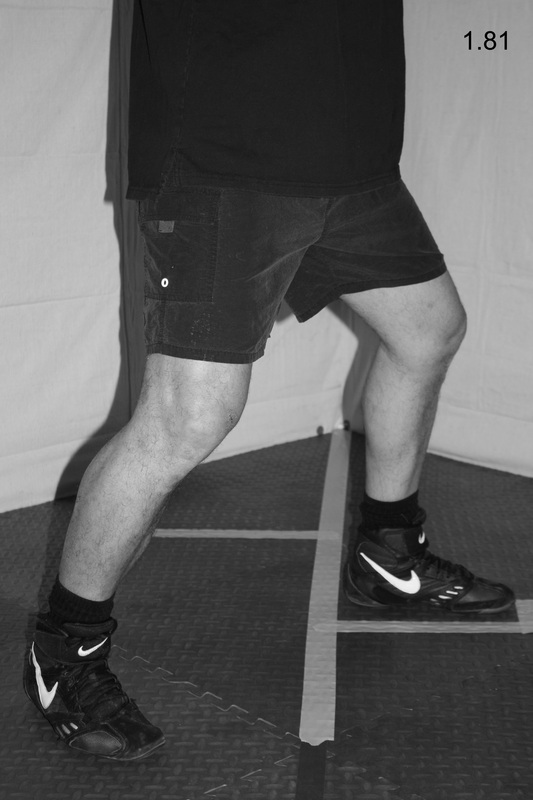 Step Two: As with the counterclockwise pivot, your entire body should move in concert with your right foot and you should maintain your fighting stance throughout the pivot. 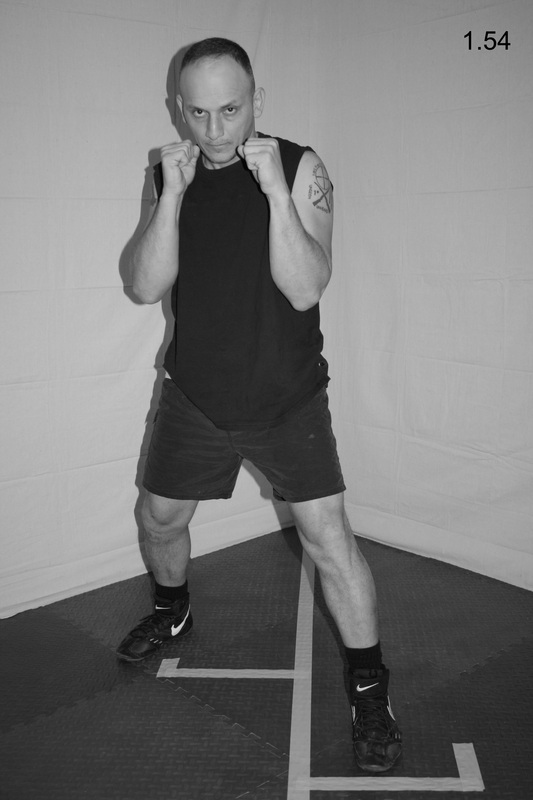 When you end the pivot, you should be back in your fighting stance at an angle to your suspect (see Fig. 1.84). 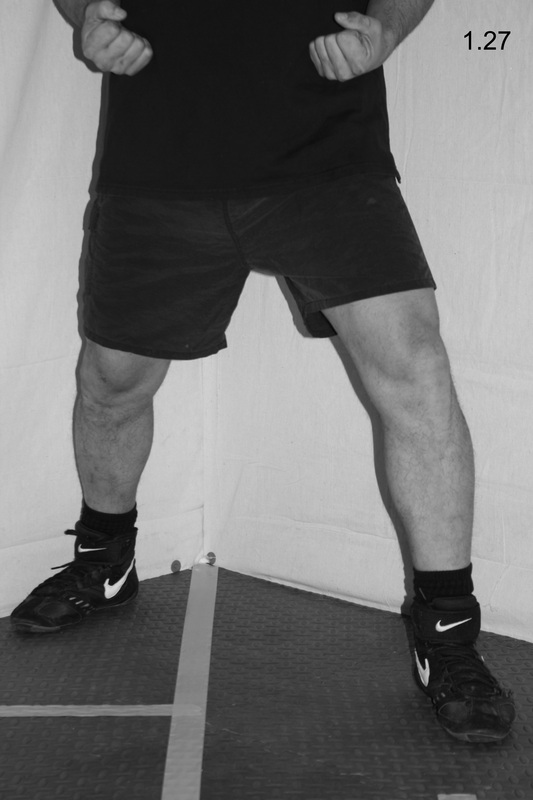 For a close-up of the counterclockwise pivot leg action, see Fig. 1.85 – 1.87. The best way to improve footwork is to actually practice the specific footwork techniques you will utilize during a physical confrontation, such as those listed previously in this chapter. In addition, there are specific exercises that can make you quicker on your feet, improve your balance while moving, and increase leg endurance. 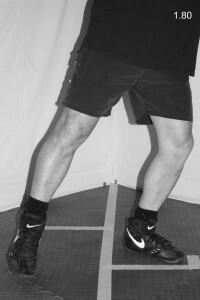 To improve your footwork, practice each of the footwork techniques daily for a set number of repetitions. 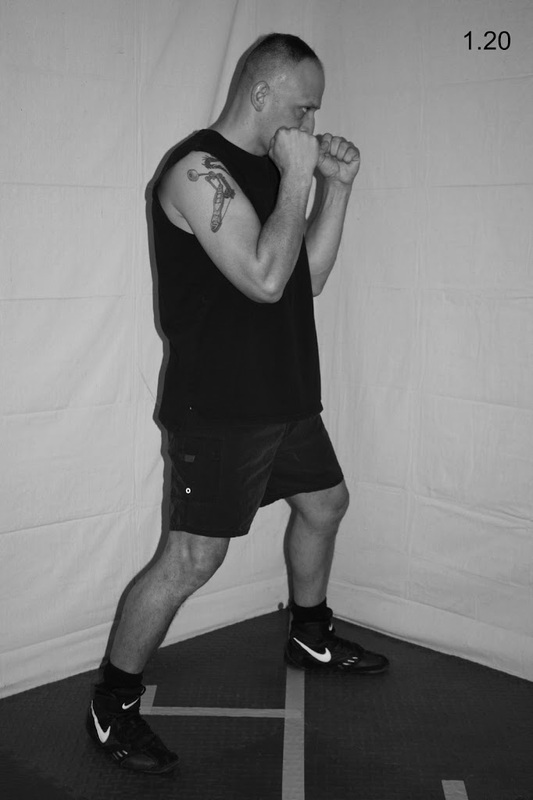 Move slowly at first and concentrate on performing each move with technical perfection. 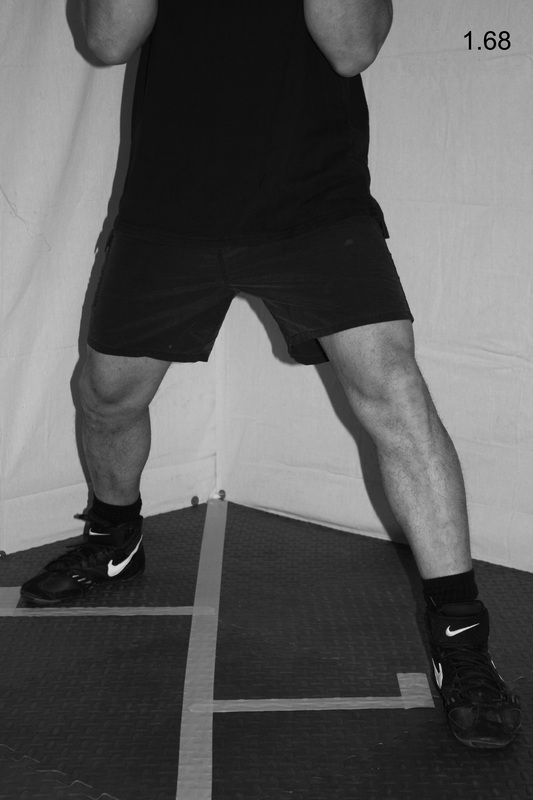 Be certain not to overstep, cross your feet, or bring your feet too close together while performing these movements. Also, remember to maintain your fighting stance while you move and remain on the balls of your feet. Once you can perform each of these techniques with ease, gradually increase your speed until you can perform them quickly and effortlessly. At this point, you can begin combining front steps with back steps with side steps with pivoting, etc. 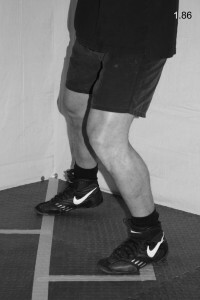 You can perform this freestyle form of footwork for a certain number of timed sets with rest periods between each set. While moving, imagine there is a suspect in front of you who is also moving and vying for a position of advantage. After only a few weeks of perfect practice, you will notice a marked improvement in your footwork and you will feel much lighter on your feet. 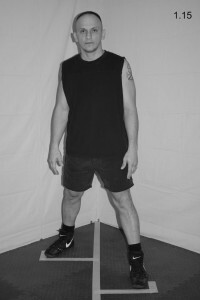 Once you can perform the various footwork techniques in combination, you can progress to a more advanced exercise that I call the “shadow drill”. 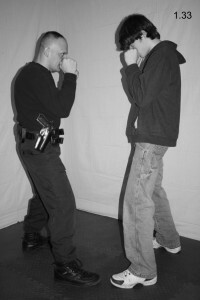 It is a reactionary drill that will teach you to instinctively react to a suspect’s movements. Much of law enforcement work is reactionary, meaning the suspect’s actions dictate what we do and when we do it. The element of surprise is on their side. 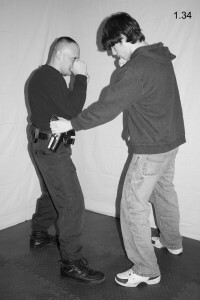 Thus, it is imperative that you learn to react quickly and appropriately to a suspect’s movements. 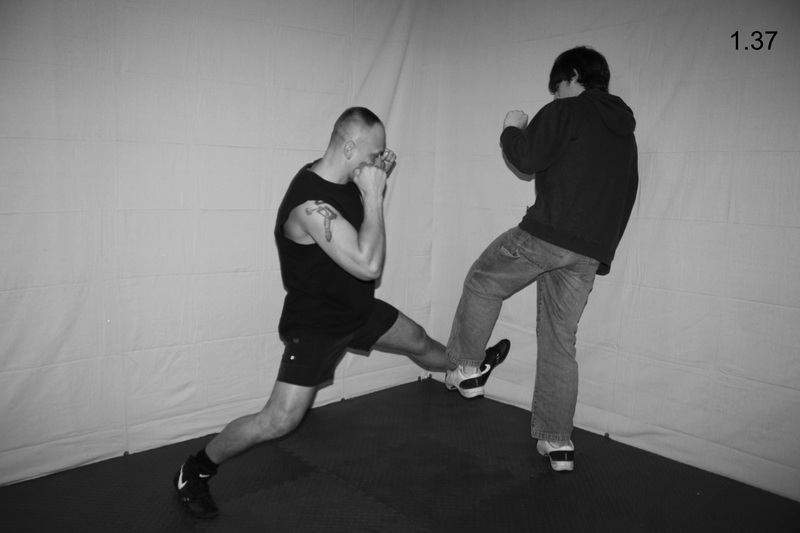 Proper footwork can quickly move you out of danger and into position to counterattack a suspect’s aggressive action. 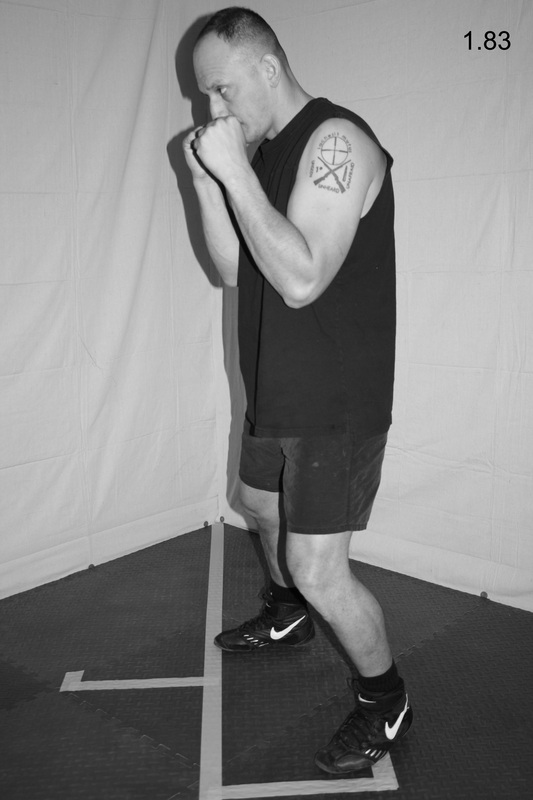 This level of proficiency can only be attained through constant, perfect repetition and the shadow drill is an excellent exercise for accomplishing this. The shadow drill is a partner drill, but the partner does not have to necessarily be a fellow officer. It can be your neighborhood buddy, your spouse, or even your child. It has always been difficult for me to find willing training partners within my law enforcement community, so I made good use of my wife and children. Not only were they helping me develop skills that kept me safe on the job, but we were also spending quality and fun time together. 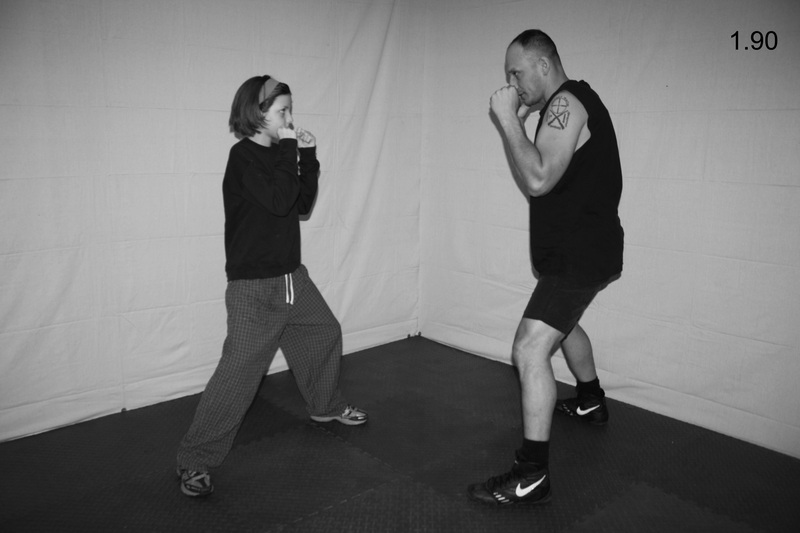 Contrary to what many think, self-defense training does not have to be boring. Utilizing our imagination and creativity, we can stay motivated while developing those skills that are pertinent to our street survival. Step One: Begin in your fighting stance in front of a partner (see Fig. 1.88). Step Two: Have your partner begin moving toward you, away from you, to your right, to your left, circling you, etc. Instruct them to move slowly at first. 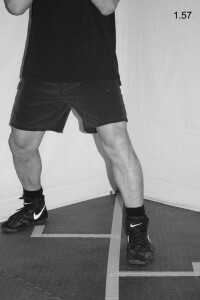 As your partner moves, mirror his or her movement by utilizing correct footwork technique. 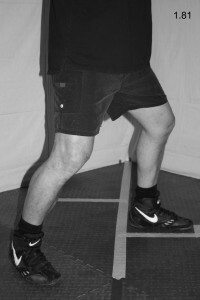 If your partner moves toward you, perform a back step (see Fig. 1.89). 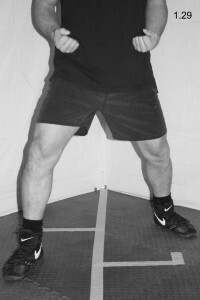 If your partner moves to your right, perform a right side step (see Fig. 1.90). And so on. Try to stick to your partner like a shadow. 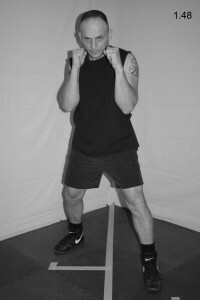 As you become more and more proficient, have your partner move faster and faster. Before long, you will feel as comfortable doing this drill as you do walking around in your everyday life. 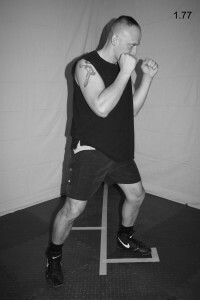 Another excellent exercise for improving footwork is skipping rope. 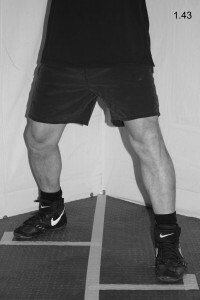 This can be a difficult exercise to perform at first. However, once you become accustomed to it, it will greatly improve your foot speed and coordination. It will also build endurance in your calf muscles and this can be important if a fight lasts an extended period of time. There are various types and styles of ropes to consider, from the heavier ropes made for strength building to the lighter ropes made for speed. There are no wrong or right answers here, just a matter of personal preference. My personal preference is the rubber rope designed for speed, since my goal is to improve my footwork speed and endurance. Once you have decided on what type of rope to go with, you need to determine the correct length. 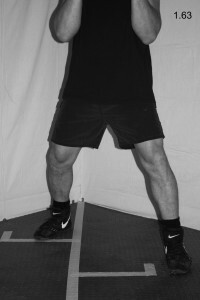 Do this by stepping on the center of the rope with both feet and raising the handles up toward your armpits. 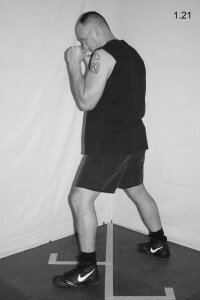 If each handle reaches the respective armpit, the rope is the correct size (see Fig. 1.91). If they do not reach the armpits, you need a longer rope. If they go beyond the armpits, you need to shorten the rope. 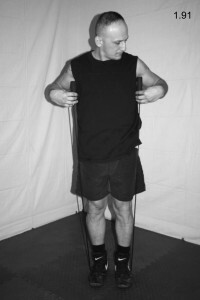 Step One: Begin standing in front of the rope while holding the handles firmly in your hands. 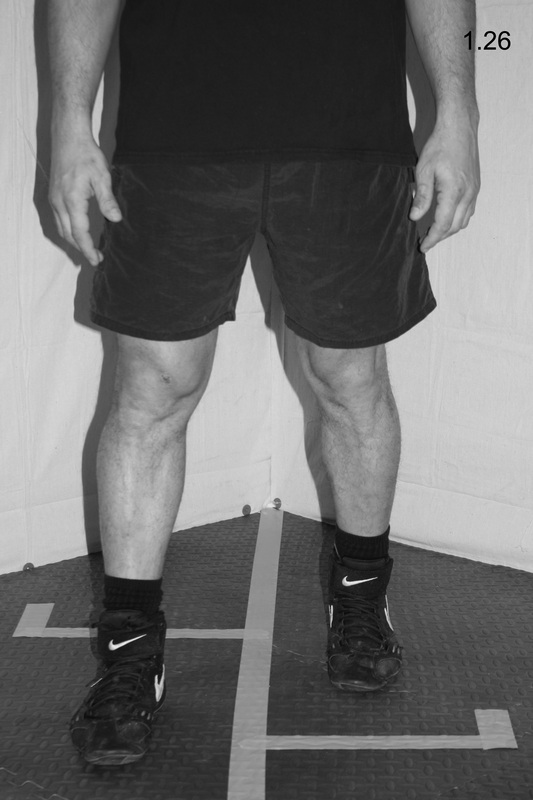 Your hands should be held about waist high at your sides (see Fig. 1.92). Step Two: Rotate your wrists and arms back, up, and over in an exaggerated arc to make the rope travel up and over the back of your head (see Fig. 1.93). 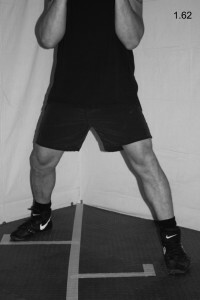 As the rope travels down along the front of your body, jump over it and continue the rotation (see Fig. 1.94). 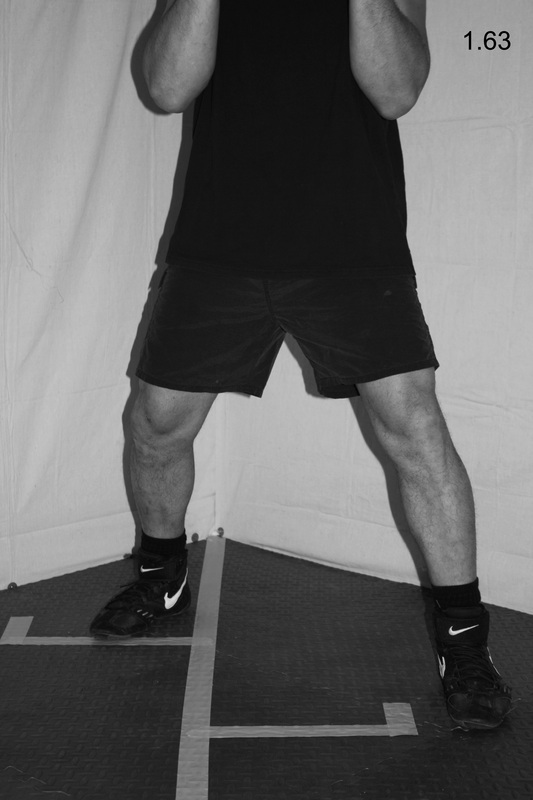 Once it gains momentum, you will use your wrists to keep the rotation going. Tip One: Make sure to jump only once for each revolution and only jump high enough to clear the rope, which should be about two to three inches. You might have a tendency to double-bounce and jump too high at first, but with practice you can alleviate this habit. Tip Two: As you skip rope, concentrate on keeping your chin tucked, as it will help to engrain this invaluable defensive technique into your mind. 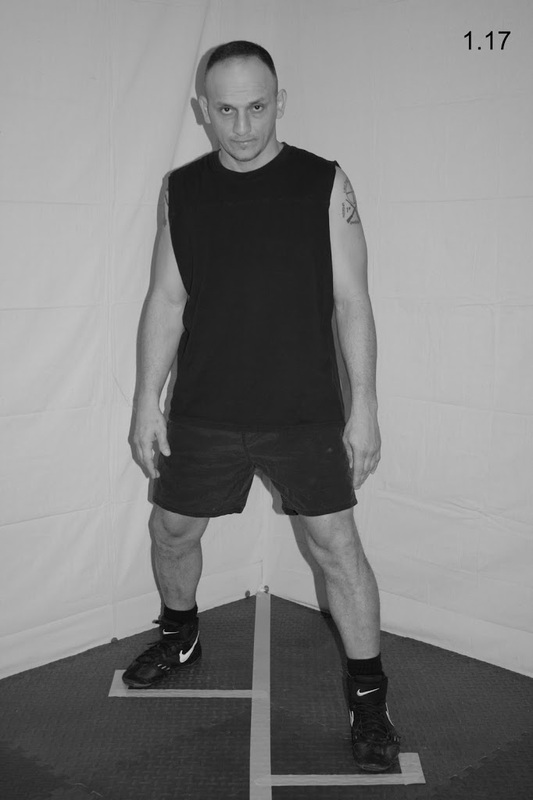 At first, you can begin skipping rope by performing a predetermined number of repetitions, such as fifty. 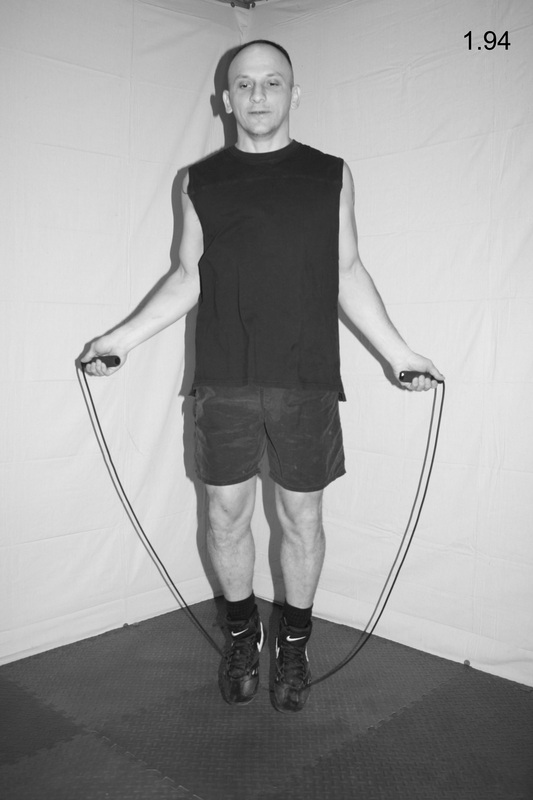 As you become more proficient, progress to skipping rope for a predetermined period of time. There are several variations to skipping rope. One is to simply jump straight up and down as the rope crosses under your feet, which gives your calf muscles an intense workout. 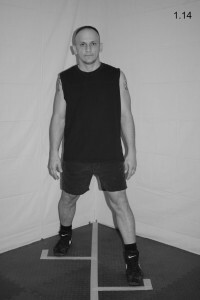 A second variation is to jog in place as you skip over the rope. 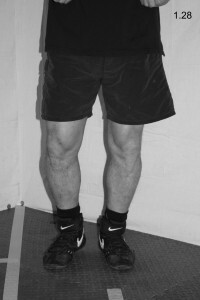 A third variation is to skip for a predetermined number of repetitions on one leg, and then switch to the other leg. As with any exercise program, mix up your routine to make it challenging and fun. This will conclude the August segment of Righting Crime Fiction. If any of you have any questions or comments or suggested topics, feel free to contact me at rightingcrimefiction@gmail.com and I will reply as soon as I can. Welcome to the July 2015 edition of Righting Crime Fiction. 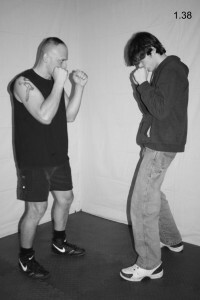 This month, I’m continuing with the “Writer’s Guide to Fighting” series and moving into footwork techniques. It might not seem like much, but footwork is as important as knowing how to block a punch. In fact, it should be considered your first line of defense in an attack. Next would be head movement and blocking. Note: Again, I am addressing your law enforcement characters directly, because it is easier and more concise than constantly referring to them as “your characters”, “s/he”, “them”, etc. The best way to avoid an attack is to not be there, which makes footwork an integral part of your defense system. Whether you are in an unarmed fight or a shootout, you will be harder to hit as a moving target than a stationary one. However, there are right and wrong ways to move during a fight, and I will detail the proper footwork techniques to utilize during a physical confrontation. This is an important section, because you could get hurt if you move the wrong way. If Drew Brees explained in detail how to throw a perfect spiral, it would not make you a better quarterback. You would have to actually get up and practice those techniques. Similarly, merely reading these instructions will not improve your footwork. You must practice them until you can perform them effortlessly and without thought. 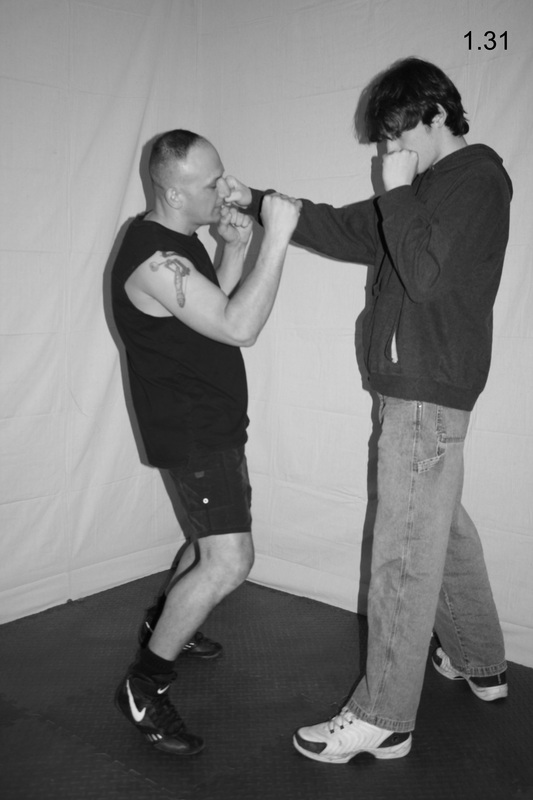 Proper movement during a fight differs greatly from everyday movement. All of our lives we have been moving around by putting one foot in front of the other, crossing our feet as we go (see Fig. 1.25 and 1.26). This is not the proper way to move in a fight. Crossing your feet in a fight should be viewed as a cardinal sin. The only way to keep from committing this sin is to spend countless hours practicing proper footwork. You will basically need to learn how to walk all over again. 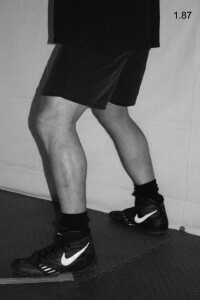 If you have never practiced this type of footwork, it will go against what seems natural to you. You might feel awkward at first, but within a few sessions you will find yourself moving quicker and more gracefully. 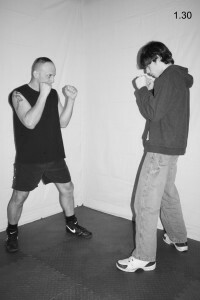 With enough practice, the techniques will become second nature and moving during a fight will be as natural to you as walking down the street. It takes time and dedication to reach and maintain this level of proficiency, but it is a small price to pay for your safety. 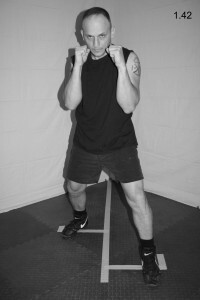 As with the fighting stance, the footwork techniques listed in this book derive from boxing. A boxer’s footwork is more practical for law enforcement work than traditional martial arts footwork. The biggest problem with martial arts footwork is that they violate the rule of not crossing your feet. 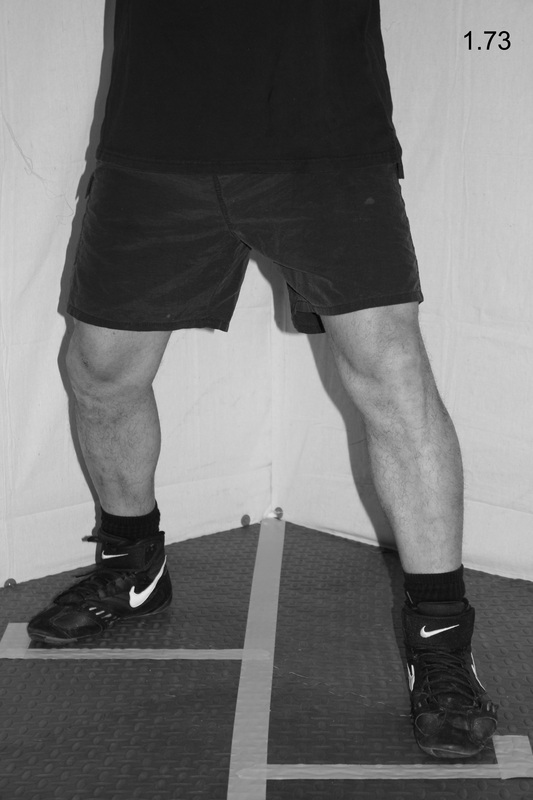 If you have ever studied traditional martial arts and have performed katas (patterns of movement that some claim will improve your fighting skills), you have violated this cardinal rule of crossing your feet (see Fig. 1.27 – 1.29). Every time you perform these katas, you are actually developing and reinforcing bad habits that could prove deadly in a real fight. Boxers are taught not to cross their feet in a fight because it will compromise their balance and leave them susceptible to knockdowns (see Fig. 1.30 – 1.32). This is especially important for law enforcement officers, because if you get knocked down by a suspect you are at his or her mercy, and most of these suspects are not very compassionate. Additionally, if you cross your feet during a fight your firearm side will be toward the suspect and it could be easily grabbed (see Fig. 1.33 and 1.34). Always remember that when moving during a fight, the foot closest to the intended direction moves first. 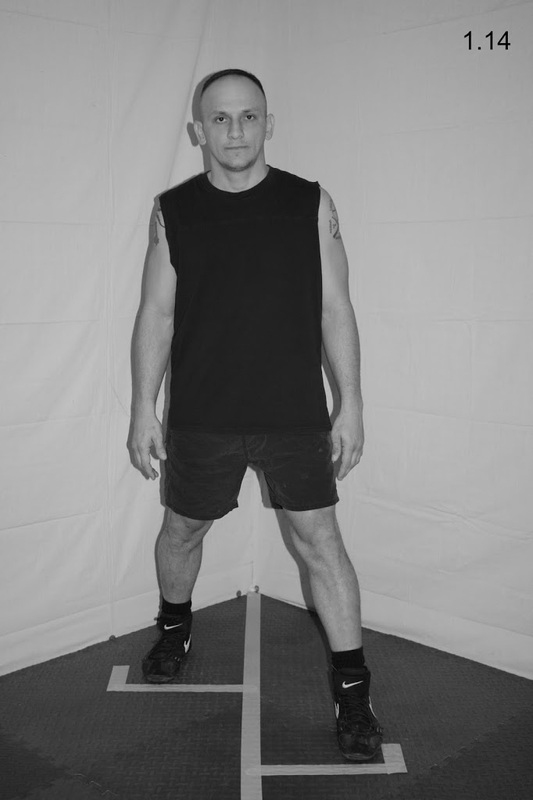 As an example, if you wanted to move forward, your lead foot would move first. If you wanted to move laterally to the right, your right foot would move first. And so on. As you move, do not lift your feet off the ground. Instead, slide the ball of your feet lightly and explosively along the ground in the intended direction, moving one foot at a time. Never hop into the air where both feet leave the ground at the same time. If both feet are in the air, you are no longer grounded and you could easily be taken down. Being grounded is crucial to remaining balanced. Maintain your balance, head position, and hand position throughout the footwork techniques. 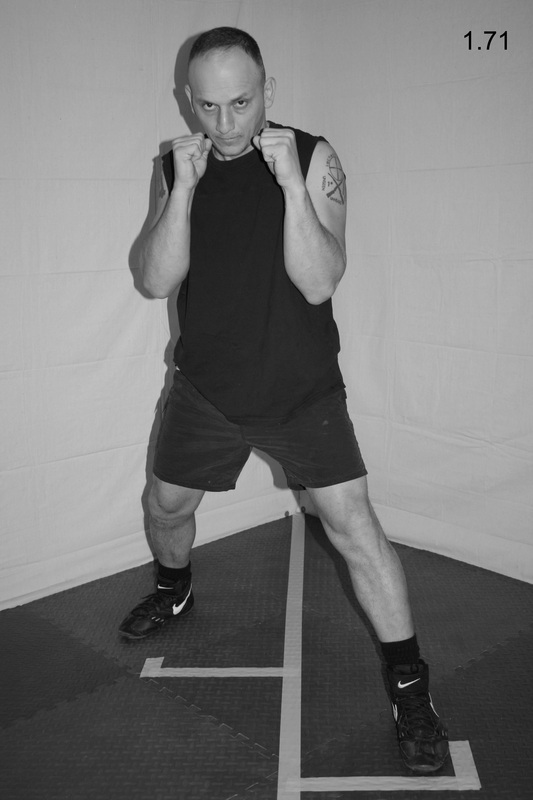 As you move, your suspect could be punching and kicking at you, so it is imperative that your chin remain tucked, your hands up, and you stay balanced. Keep your movements short, quick, and smooth. Each foot should travel the same distance as the other. 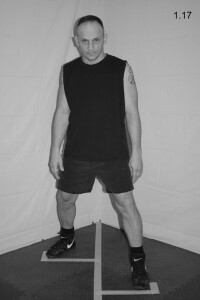 For example, if you move your left foot eight inches forward, you should also move your right foot eight inches forward. This will ensure you always return to the proper fighting stance. 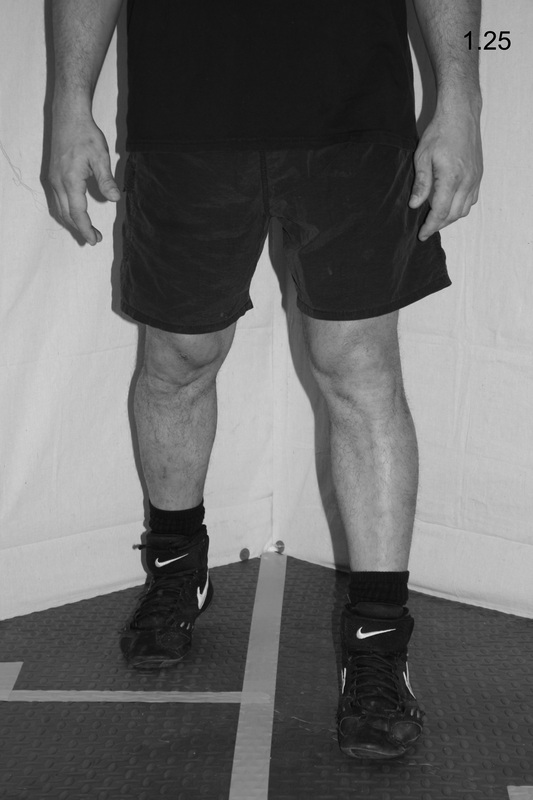 Do not move your feet too far apart. If you slide one foot too far from the other when moving, your stance will be too wide and you will be susceptible to leg sweeps (see Fig. 1.35 – 1.37). Likewise, you should not allow your feet to get too close together, because you could leave yourself open to double-leg takedowns (see Fig. 1.38 and 1.39). I will cover eight footwork techniques that will enable you to maneuver effectively during a fight with a suspect. 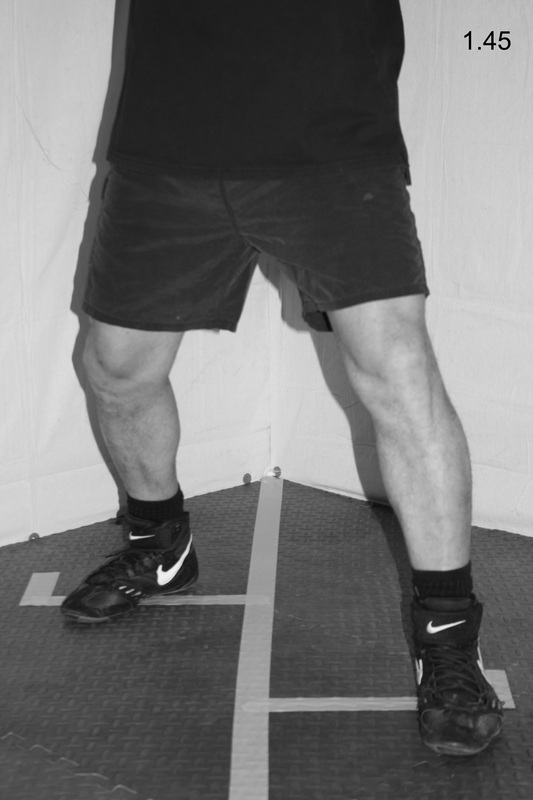 If your suspect is moving away from you or if you need to move closer to your suspect to execute combinations, you will perform the front step. A good strike to execute in conjunction with a front step is the left jab. 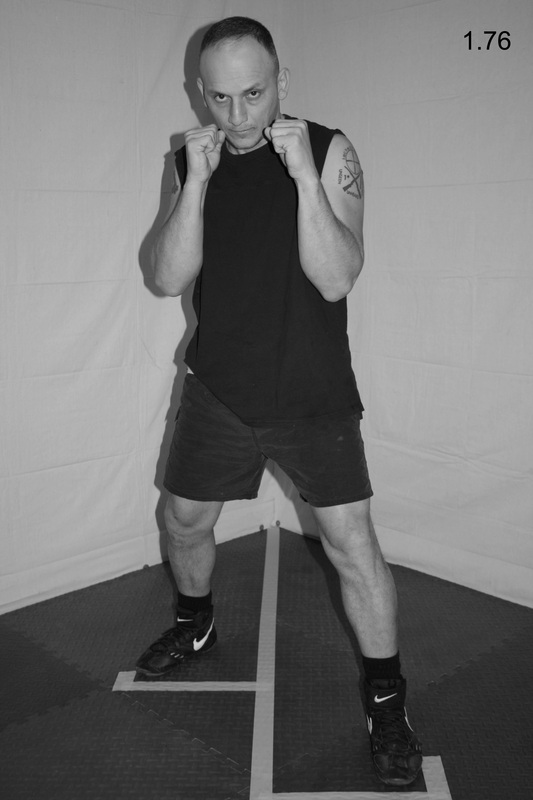 From your fighting stance (see Fig. 1.40), push off with the ball of your right foot and slide your left foot about one half step forward, which should be about six to twelve inches (see Fig. 1.41). 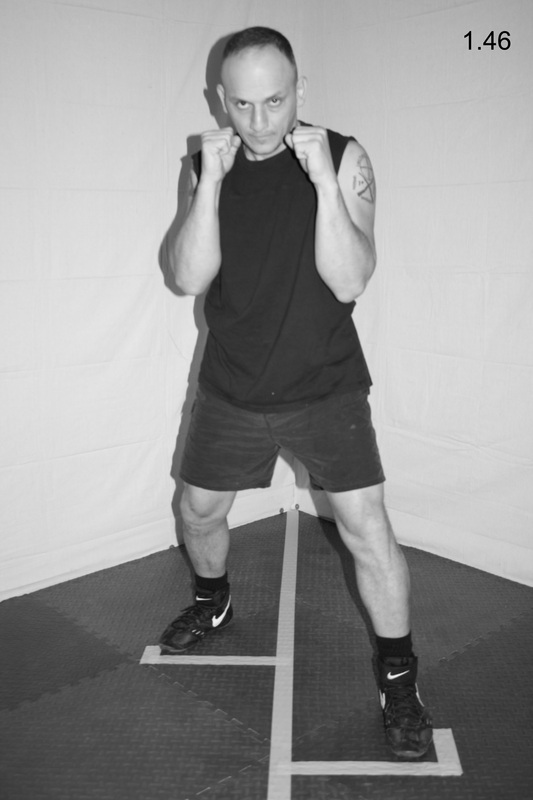 Quickly drag your right foot forward the same distance the left foot traveled, which will return you to your fighting stance (see Fig. 1.42). 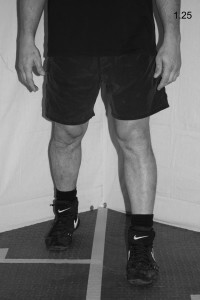 As an example, if the left foot travels six inches, the right foot should also travel six inches. 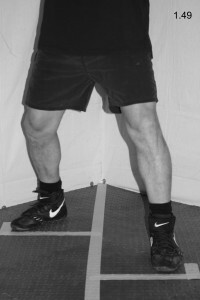 As mentioned in Key Two, the ball of your right foot should drag the ground lightly as it moves forward. For a close-up of the front step leg action, see Fig. 1.43 – 1.45. If your suspect is advancing toward you, you can perform the back step to create distance between yourself and the suspect. 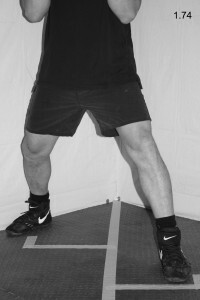 You can also perform the back step if you need to create distance to allow you to perform a particular strike. 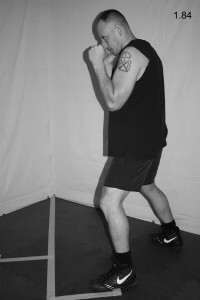 For instance, if you are in punching range and you wish to execute a kick, you can perform a quick back step to give you the room to execute the kick. Additionally, be mindful that it is not always good to move directly rearward as a suspect advances toward you. 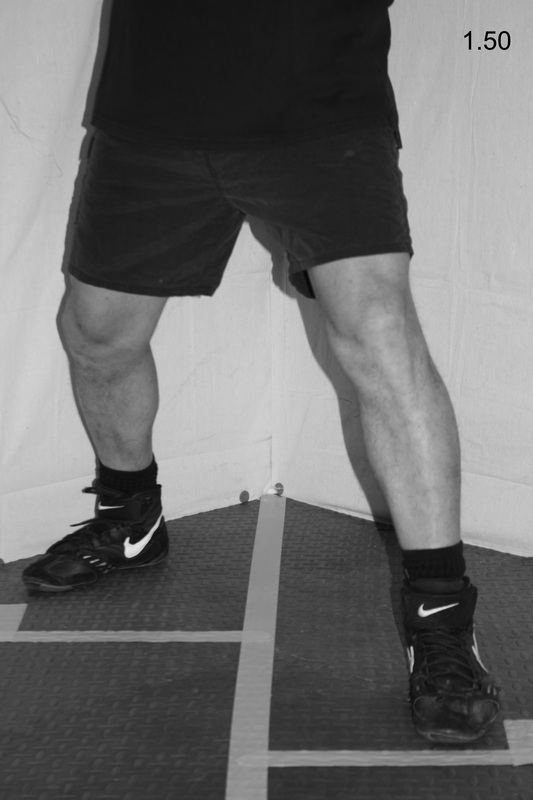 You will want to create angles and pivot to get out of the way, so you will need to utilize the back step in conjunction with other footwork techniques. 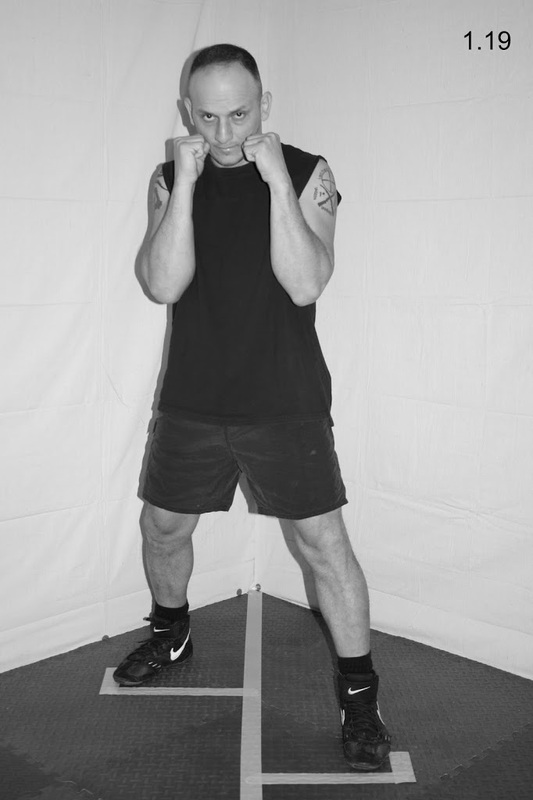 From your fighting stance (see Fig. 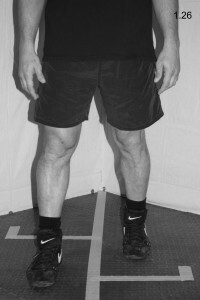 1.46), push off with the ball of your left foot and slide your right foot about one half step rearward, which should be about six to twelve inches (see Fig. 1.47). 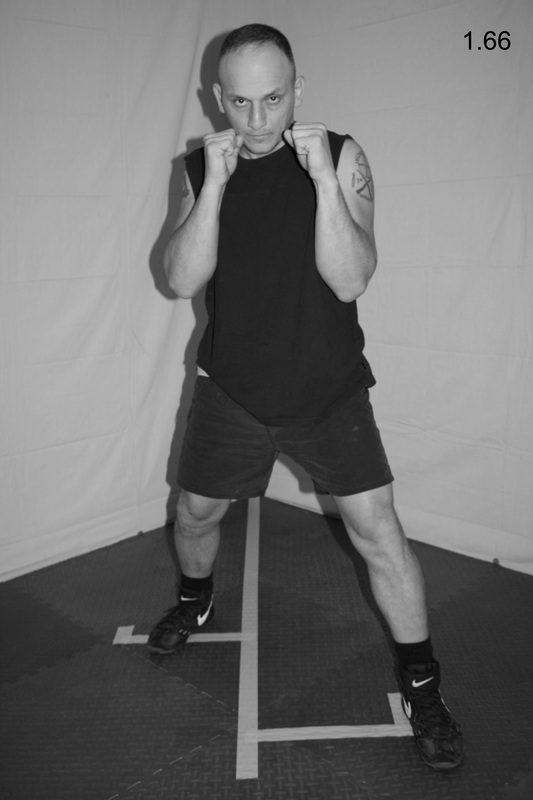 Quickly drag your left foot rearward the same distance the right foot traveled, which will return you to your fighting stance (see Fig. 1.48). For a close-up of the back step leg action, see Fig. 1.49 – 1.51. If your suspect moves to your right, you can mirror him by performing the right side step. If he tries to circle around to your right to get behind you, you can also use the right side step to cut him off. If this happens, you must be prepared to execute strikes immediately upon taking that step. A good strike to use in cutting off your suspect to the right is the right hook punch or the right Muay Thai kick. 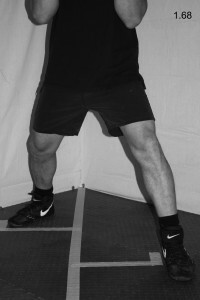 You can also use the right side step to avoid attacks and create varying angles of attack. For instance, if your suspect executes a straight kick or punch, you could perform a right side step and then immediately execute a strike of your own before he realizes you are “gone”. 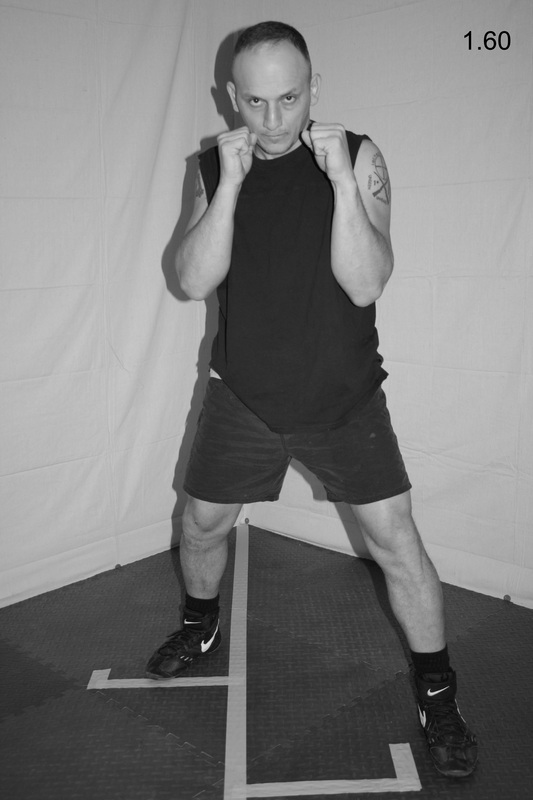 From your fighting stance (see Fig. 1.52), push off with the ball of your left foot and slide your right foot about one half step to the right, which should be about six to twelve inches (see Fig. 1.53). 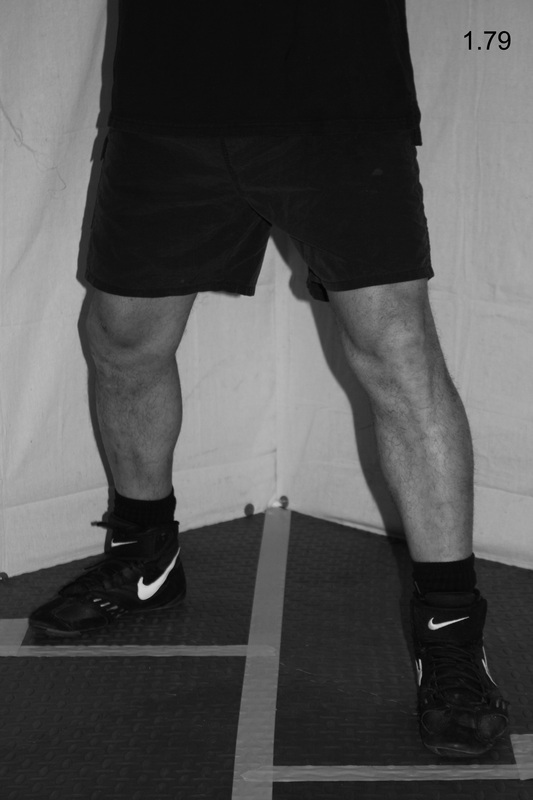 Quickly drag your left foot laterally the same distance the right foot traveled, which will bring you back to your fighting stance (see Fig. 1.54). For a close-up of the right side step leg action, see Fig. 1.55 – 1.57. If your suspect moves to your left, you can mirror him by performing the left side step. If he tries to circle around to your left to get behind you, you can use the left side step to cut him off. 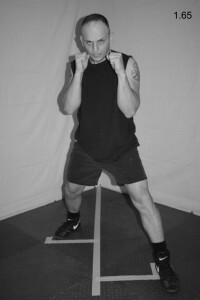 Like with the right side step, you must be prepared to execute strikes immediately upon taking the side step. A good strike to use in cutting off your suspect to the left is the left hook punch or the left Muay Thai kick. Like the right side step, you can use the left side step to avoid attacks and create varying angles of attack. 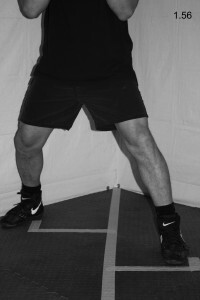 Since your body is positioned at a forty-five degree angle to your suspect, you will create different angles by moving left than you would by moving right. You should use this to your advantage. 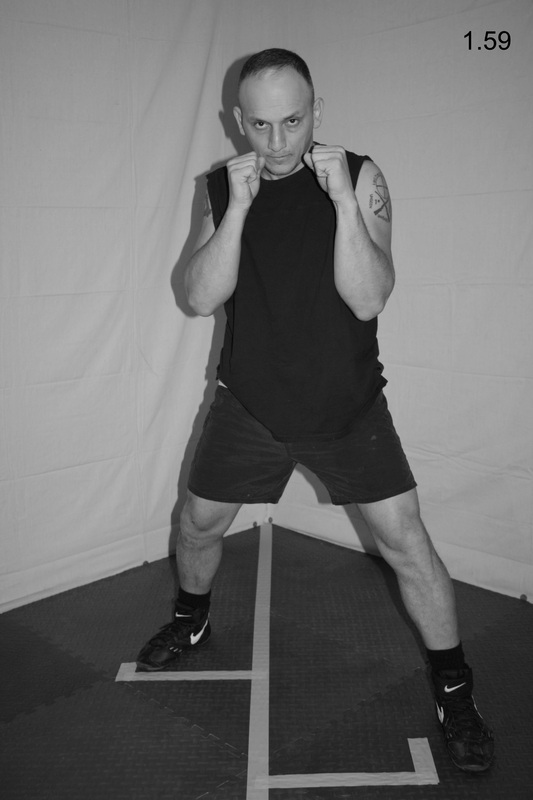 From your fighting stance (see Fig. 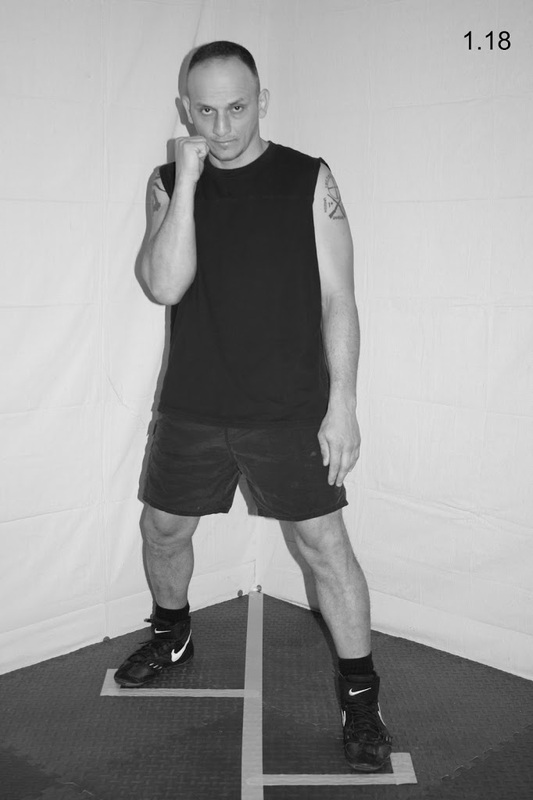 1.58), push off with the ball of your right foot and slide your left foot about one half step to the left, about six to twelve inches (see Fig. 1.59). 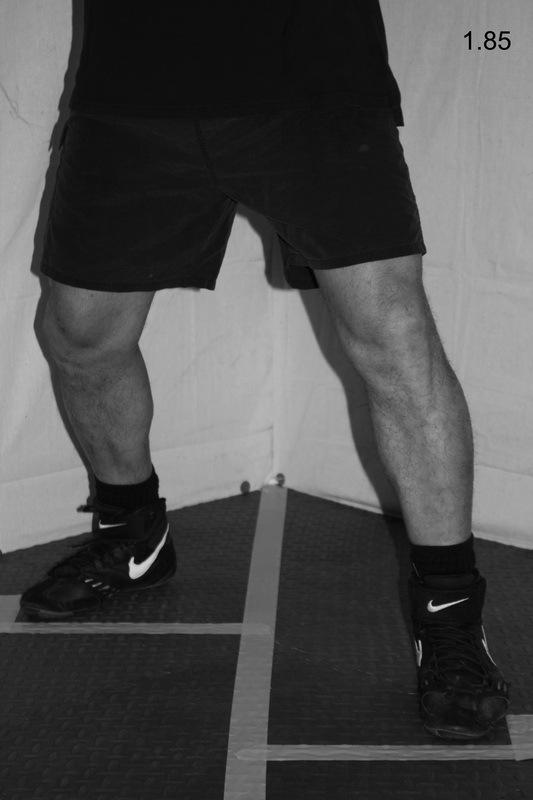 Quickly drag your right foot laterally the same distance the left foot traveled, which will bring you back to your fighting stance (see Fig. 1.60). For a close-up of the left side step leg action, see Fig. 1.61 – 1.63. That will wrap up the July segment of Righting Crime Fiction. If any of you have any questions or comments or suggested topics, feel free to contact me at rightingcrimefiction@gmail.com and I will reply as soon as I can.